Meanwhile, Liverpool are weighing up a move for Napoli’s Lorenzo Insigne. 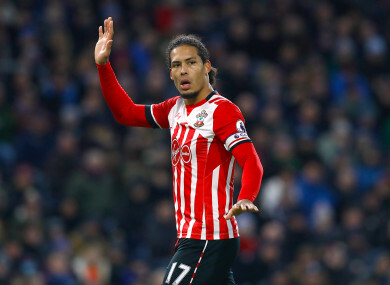 Virgil van Dijk is out of favour at Southampton. Stoke appear to be on the verge of signing Jese Rodriguez from PSG on loan until the end of the season, while Mark Hughes’ side are also set to sell Joselu to Newcastle for £5 million (€5.5m). Chelsea are believed to be considering a move for Inter’s Ivan Perisic, who has been heavily linked with Man United in the past. In addition, Jose Mourinho’s side are believed to be contemplating activating the £36.5m (€40m) release clause of Barcelona midfielder Sergi Roberto. The Red Devils are also close to signing 19-year-old forward Bruno Amorim from Oliveirense. Liverpool are weighing up a move for Napoli’s Lorenzo Insigne and could bid for the player if they fail to keep hold Philippe Coutinho. Chelsea are set to make a move for £50m-(€55m)rated Southampton defender Virgil van Dijk. With his Arsenal future uncertain, Newcastle are targeting England international Jack Wilshere, who was left out of the Gunners’ squad for their game with Leicester on Friday. Tottenham are expected to step up their interest in out-of-favour Lazio attacker Keita Balde. Downing joined Liverpool for a fee believed to be around £20 million (€22 million) from Aston Villa in July 2011 — £8 million (€8.8 million) more than the latter paid for him two years previously. The winger spent two years at Anfield, scoring three goals in 65 appearances, before joining West Ham for £5 million (€5.5 million) in August 2013. Now 33, he currently plays for Middlesbrough, his boyhood club, having re-signed for them in 2015. Nevertheless, his time at Garry Monk’s side appears to be coming to an end, with Harry Redknapp’s Birmingham recently linked with a move for the player. Email “Chelsea want €55 million Van Dijk, United close in on Portuguese prodigy and all today's transfer gossip”. Feedback on “Chelsea want €55 million Van Dijk, United close in on Portuguese prodigy and all today's transfer gossip”.